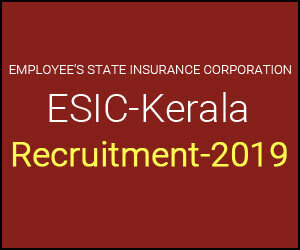 New Delhi: The Employees’ State Insurance Corporation, Kerala (ESIC Kerala) releases 14 Vacancies for Specialist, Senior Residents on Part-Time, Full-Time on Contractual Basis. The Selection Will be done on the basis of Walk-in-interview. Walk-in-interview will be held on 04-04-2019, 09.00 AM. Candidates for the post of FTS/PTS, SR-3 Yr, SR-1 Yr and Homoeo Pharmacist -04.04.2019, 09.00 AM. The Medical Superintendent, ESIC Hospital, Udyogamandal, Ernakulam proposes to hold a walk in interview for the said posts. Qualification: MBBS and PG Degree or equivalent, with 3 years experience or PG diploma with 5 years experience in respective specialty after PG. Full Time Specialist– Age not exceeding 45 years as on 04.04.2019. Relaxation for reserved categories as per rules. Part Time Specialist– Age not exceeding 64 years as on 04.04.2019. Full Time Specialist- Basic Pay Rs.18750/- + Grad Pay Rs.6600/- , DA, HRA and NPA as admissible or as per orders issued by ESIC Headquarters Office from time to time. Total emoluments Rs.87,278/– (Approx.). Remuneration under revision upon implementation of VIIth CPC. Part Time Specialist- Remuneration Rs.40,000/- per month for 4(Four) hours session per day for 5 days in a week. Additional Rs.8,000/- admissible if willing to perform emergency call duty. Additional Rs. 1000/- for extra session of 2(two). The Vacancies are in the Department of General Medicine, General Surgery, Dermatology, Radiology. Qualification: PG Degree/Diploma in concerned speciality from recognized university. Age: Not exceeding 37 years as on 04.04.2019. Remuneration: For PG Degree & PG Diploma holders- Basic Pay Rs.67,700/- and other allowances as per rules. Total emoluments Rs. 1,07,232/- (Approx.). The Vacancies are in the Department of General Surgery, Orthopaedics. The Vacancies are in the Department of Casualty and various departments. Qualification: PG Degree or PG Diploma in medical /surgical specialities. Age: Not exceeding 37 years as on 04.04.2019. Relaxation for reserved categories as per rules. Interested Candidates are advised to attend WALK-IN-INTERVIEW on the said date, at ESIC Hospital, Udyogamandal, Ernakulam with application in the prescribed proforma, all original documents, one set of xerox copies of all original documents and one recent passport size photograph (affixed on the application). Application fee: Rs.250/- (Rupees two hundred and fifty only) for General/OBC Candidates and Rs.50/- (Rupees fifty only) for SC/ST candidates by way of Demand Draft drawn in favour of ESI Fund Account No.1 payable at SBI, Kalamassery. Female applicants are exempted from Application Fee.